I am always on the lookout for ways to increase my kids calories with nutrient dense foods. For awhile their lunches were doing well but kids grow… and they need more calories. Sigh. It’s never ending. You think you figure it all out and then suddenly they are eating even more! I seriously wonder sometimes how in the world, I’ll be able to feed them enough! We started adding grains to their lunches to help fill in the calorie gaps because grains are one of the easiest and cheapest ways to up those calories… but I prefer limiting our grains so I started searching for a easy replacement. I wanted to increase my children’s protein intake anyway because my kids are always on the tiny side of things so we swapped the nutrient lacking grains for protein packed meatballs. But not just any meatballs, deliciously simple meatballs because when you are cooking for so many kids, you need simple! Of course, these meatballs are not just limited to kid food! 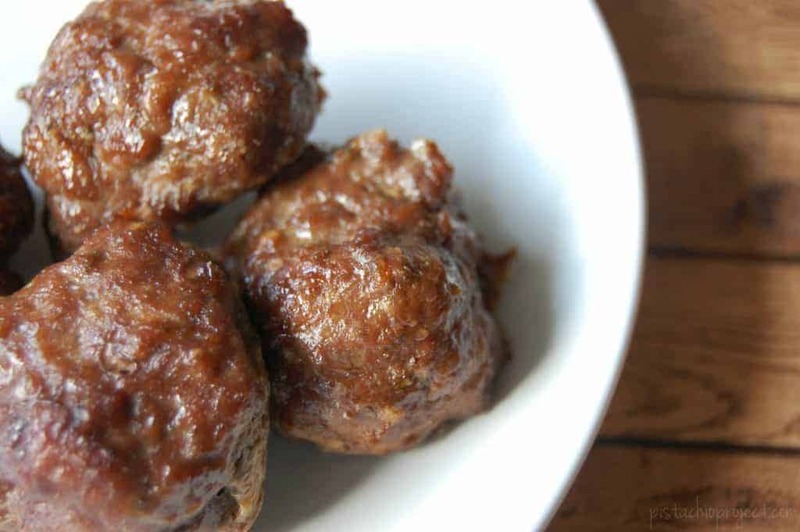 These deliciously simple meatballs can be used for spaghetti and meatballs, sweetish meatballs, even those appetizer meatballs covered in sauce! Most meatball recipes use some grain as a filler. Most of the time that means breadcrumbs but I’ve seen oats and other grains as well. As I mentioned, I was looking to decrease our grains so I wanted a meatball without the grain filler. 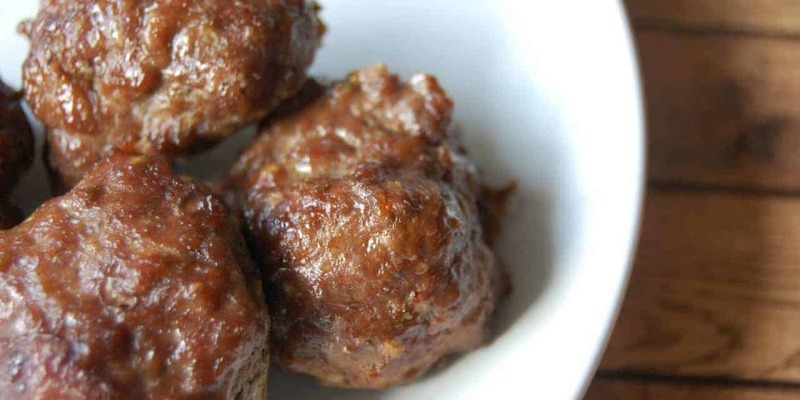 There are a few meatball recipes out there that fit the bill, usually titled paleo meatballs. I’m not paleo but it is nice to know that I can count of paleo recipes to fit my nutrient packed requirements. After checking out a few recipes and tweaking my meatball batches, these deliciously simple meatballs were born. 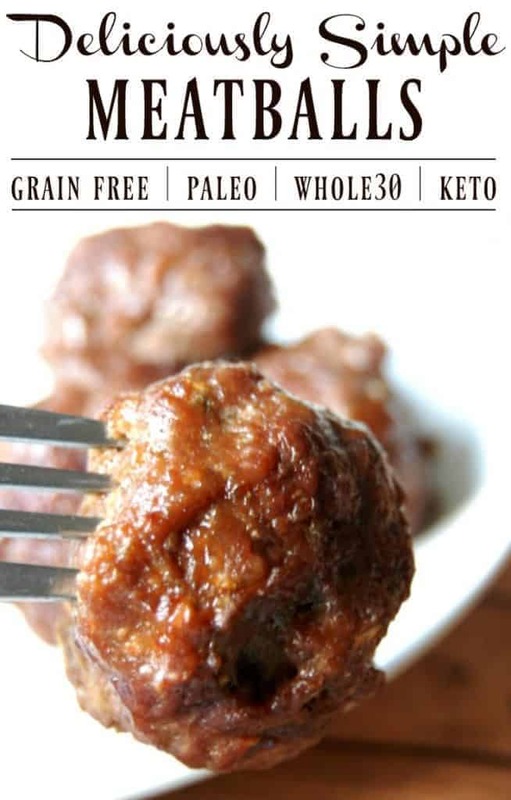 Whether you are trying to eat grain free, gluten free, whole30, paleo, or even keto… these meatballs fit the bill! So make a great big batch and enjoy! You can even feel ok passing them off to your friends who are eating a more standard diet and they will still think these meatballs are delicious! Also, as I mentioned I need easy meals for all these kids I’m feeding so what I like to do is make large batches of meatballs. It ends up looking a bit like an Italian kitchen in my house! I cook a few batches of meatballs, and then I freeze them! When we need meatballs for a meal, I open the freezer and pull out a bag of frozen meatballs. I take out however many I need and then heat them back up! So simple! Need a different variation? Try my Taco Meatballs which are also grain free! Preheat oven to 375 degrees. In medium bowl, add all ingredients. Mix ingredients until fully incorporated (you will likely need to use your hands). Divide mixture into 16 pieces and shape into meatballs. Place on to a rimmed baking sheet. Serve or freeze for later! Looking for more Whole30, Paleo, or Keto recipes? These look amazing! WOW! Cannot wait to try them! I am ALL about simple!! Thanks for the great recipes and for sharing it on the Hoemestead Blog Hop! I hope we see you there again today. Pinning!! Lots of kids… delicious… simple… You're speaking my language. haha. Thanks for sharing these at Savoring Saturdays, Brittany – I'm featuring them at this weekend's party. Hope to see you back! This meatballs look delicious and I love that you use grass fed beef. I only eat and buy from a local farmer grass fed myself. Thanks for sharing on Real Food Fridays. Pinned & tweeted. I like to use several types of meat in my meatballs, and they are absolutely the BEST. The last time I made them, I used Buffalo, beef, chicken, lamb and turkey. I froze several and they were the best meatballs ever! I didn’t add any filler, either, just the meatballs and seasonings, much like yours here. I suggest you try using several types of meat in yours, you’ll be surprised at the difference. Holy cow! These were so good.! I’m glad I came across this. For some reason I have it in the back of my mind that meatballs are labor intensive and take forever. Not sure why but these look super easy to whip up and freeze. Definitely going in the meal rotation. I want to try these, they look so good! Do you think it would work without egg? My daughter is allergic. You definitely can make them without eggs. You may want to play with an egg substitute (gelatin egg or chia seed egg) just to help bind things better. Absolutely delicious!! My new favorite meatball! Thanks for sharing your recipe! How would it work with ground turkey instead if beef? Yes, it should. It is possible that it won’t be quite as moist but I’ve definitely made chicken meatballs before with this recipe. You could serve them as is…. I’m not sure that I’ve ever attended an event where plain meatballs were served. Spaghetti sauce obviously goes well with them as does the standard sweet/sour sauce. Maybe plain with some sort of mustard for dipping? I just had family come in town. We knew they would be hungry.We didn’t want the standard ground beef spaghetti or hamburgers. Saw your recipe with sides of rice and vegetables. It was a HIT!!! Everybody loved them! Thank you. Can I put these in the fridge overnight, or is it best to freeze them? I want to make them at night to add to my spaghetti sauce the following night. You can definitely put them in the fridge overnight! Thanks! I love simple, healthy dishes that kids would like! Can I omit the egg for allergy? Will still be great yoh think? I think you can omit the egg. It might just end up being a bit more dense of a meatball.